Here is another pool equipment installation project that we performed in Carmel Valley, CA, 92130. This specific job required us to replace a old pool pump with a new variable speed, energy efficient pool pump, install a new PureChlor salt water pool system and do some plumbing work. 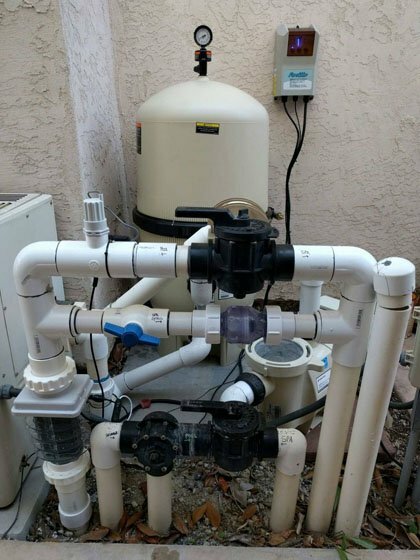 This customer in Carmel Valley, CA, 92130 wanted to install a salt water pool system and was also thinking about upgrading her pool pump and pool filter. 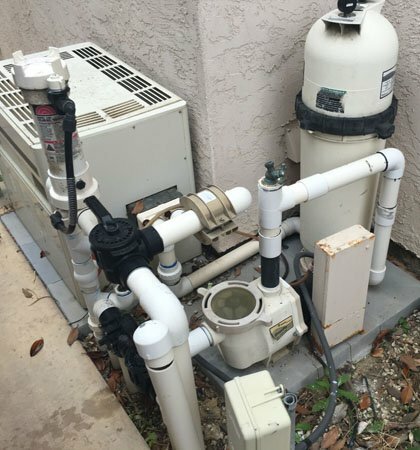 One she realized the energy efficiency and money saving opportunity of the new variable speed pool pump and filter, she wanted a complete pool equipment upgrade. We started by installing a new PureChlor salt water pool controller as this system is competitively priced and the salt water cell comes with a substantial warranty. This is an average sized swimming pool, so we we installed the 40k gallon PureChlor salt water pool control system. The old pool filter was not properly sized so we installed a new Pentair Clean & Clear plus 420 sq ft pool filter to allow for better water flow and a higher rate of sanitizing the water. Pool filters are either cartridge, D.E. or sand for most residential pools and we prefer to install cartridge pool filters as they are easier to clean and offer higher flow rates and longer times between pool filter cleans. We also removed the old Pentair WhisperFlo to install anew energy efficient Pentair variable speed pool pump. This worked well as we did not have to perform any major pool plumbing as the WhisperFlo pumps are the same height as the new variable speed pump and that saved us from replacing any of the suction side Jandy valves. This job was done in Carmel Valley, CA, 92130 though, we also offer this pool service throughout San Diego County.